The Thermo Scientific Convection Incubator PR205065M offers microprocessor control and uniform circulation throughout the chamber. This 4.5 cu ft capacity incubator uses mechanical convection, pushing heated air with a fan located at the base of the chamber, for an overall uniformity of 0.5°C. This benchtop lab incubator is operated through the digital control panel with touch pad, allowing users to set their desired temperature, between 30-75°C in 0.1° increments. 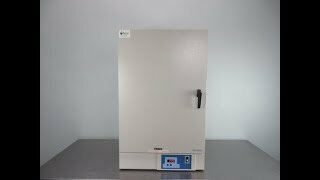 The Precision Incubator features a safety back up, should the primary heater fail, the back up will take over and an alarm light will alert users to the fault. Inside this mechanical convection incubator is an easy to clean stainless lining, and a convenient electrical outlet to support peripheral instrumentation, like a rotator or a rocker. When users want to check on sample progress, this benchtop incubator has a glass door, allowing easy viewing while keeping environment disturbances to a minimum. The Thermo Precision High Performance Mechanical Convection Incubator is built to be dependable, with 3” of fiberglass insulation to protect against temperature fluctuation, and a durable enamel coated exterior to stand up to everyday use. This Thermo Scientific Convection Incubator PR205065M has been fully inspected and comes with a clean bill of health. All of our lab equipment comes backed with our standard warranty. Should you have any questions about this or any of our lab incubators, please don't hesitate to contact us.